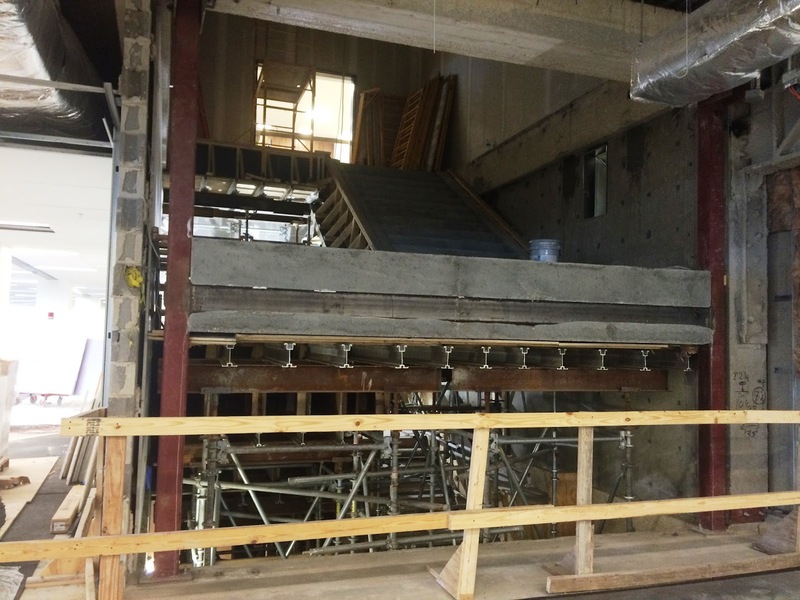 Late last week crews were finally able to complete the pouring of cement for the fabrication of the 5th and 6th floor stairs in the library's central stairwell. In the long process that determined the best method for accomplishing this task, the construction contractor ended up using a different cement mixture than the one that would have needed 21 days to cure before the stair forms could be removed. The new mixture may be cured enough to remove the forms within about a week. Moisture content, temperature, and other properties of the cement will likely be assessed within the next day or so. If the pour is judged to be successful, the focus will shift toward determining when the supports and scaffolding in the lower portions of the stairwell can be removed, and when some or all of the stairwell might be returned to use. 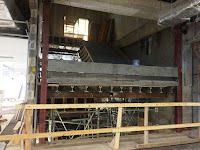 When the central stairwell is cleared of the supports and scaffolding, new glass rails will need to be installed for all the stairs at all levels from the basement up. In late summer, when the fabrication of the 5th and 6th floor stairs wasn’t behind schedule, the plan for the glass rails was to install them in a phased sequence--a little at a time. With time running out in the construction schedule, it may be decided to lay in the rails under a more concentrated timeline with the stairwell still closed. Below is a chart that illustrates some key projects in the final stages of the construction timeline, including key projects remaining. While the construction itself will wind down as planned later this fall, the new 5th and 6th floor spaces likely will not be ready for general use until collections and staff can be moved into them. The moving project will be enormous and involve the careful packing, transport, and reshelving of more than 55,000 linear feet of collections. With some funding issues now resolved, the project may be put out to bid within the next couple of weeks. If so, the first of three phases of the move would begin during the winter intersession with the second and third phases following in the first half of the spring semester. If all goes well, the new floors might be opened for general use upon completion of the first phase, i.e., for the start of the upcoming spring semester. The first phase of pile driving to lay foundations for new stairs for the emergency exits of the building has been completed on the backside of the building and adjacent to door exiting the center of the Technical Services area on the library’s 1st floor. The next set of piles is expected to be driven this week, likely on Tuesday, for the exit on the Freret Street side of the building. Preliminary to the pile driving on the Freret Street side of the building, workers are removing some cement that had been part of the former temporary library entrance within the same fenced area. The city’s elevator inspector has now issued a conditional “contractor’s” permit to bring online elevator #2, which is the middle elevator in the elevator lobby of each of the building's floors. This effectively designates elevator #2 for construction use only, while construction continues. Elevator #3, the closest elevator to the west side of the building in each lobby, is now functioning as library use only (for library personnel and library users). Meanwhile, crews from Schindler Elevator Co are now focused on finishing elevator #1. Its primarily remaining issues are some glitches with the new controls on its second door that opens facing the back of the Help Desk area on the 1st floor and replacement of overhead bearings to eliminate the same slight vibration that the inspector had noted in elevator #2. Once these items are resolved an inspection for elevator #1 will be scheduled ASAP. Elevator #1 would also function as library use only (for library personnel and library users). The engineers from MCC Mechanical, MCC Metal, MCC Commissioning, Siemens Controls, and Siemens Pneumatics are still slowly working on their examination of the building’s entire HVAC system to determine what’s working now and what’s still not. The process is expected to take a few more days. Temperature and humidity readings have continued to show some improvement in the building’s climate overall, although problems are being addressed in isolated areas such as hot spots where only warm air has been emitting from air vents. 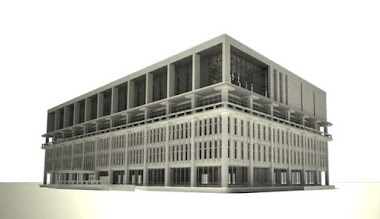 Example hot spots include some offices on the 4th floor; the 3rd floor classroom area, especially rooms 306 and 309; the 2nd floor admin office area; and the 1st floor area near the entrance and closer to the Dixon side of the building. The Latin American Library closed stacks area on the 4th floor is still overcooling. These problems should eventually be resolved by the replacement of broken thermostats, actuators, and dampers.